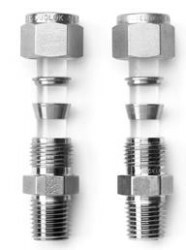 SSP Duolok tube fittings are designed and manufactured to provide a reliable, leak-proof connection in instrumentation and process tubing systems. Duolok tube fittings consist of four precision-machined components: Body, Front Ferrule, Back Ferrule and Nut. The double ferrule design, with the staged sequential swaging action of the ferrules during make-up, compensates for the variations in tubing materials, hardness, and thickness of the tube wall to provide leak-tight connections in an extensive range of applications. Additionally, in fulfilment of the design criteria, all Duolok components are manufactured with stringent tolerances and superior surface finishes under rigorous quality control standards to assure the optimum performance of each component. Duolok tube fittings are designed, manufactured and quality controlled to be totally “interchangeable” with the Swagelok® brand of tube fittings.